Get inspired and empowered to use compost tea with confidence. 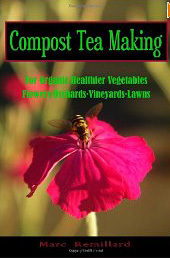 Compost Tea Making is a short book covering all you need to know to start using compost tea on vegetables, flowers, orchards, vineyards, and lawns. It addresses when, why, and how to use it for fertility as well as disease suppression. It offers recipes tailored to different situations, and explains how to produce suitable compost or worm castings to use in the brewing process. The text works hand-in-hand with some fabulous photos of magnified microorganisms to render the mysterious, microscopic life that powers compost tea comprehensible at last! Aerobicity, protozoa, biofilm, and more, become fascinating and useful terms in this manual. The author cites both modern science and “wisdom accumulated through the ages” (ancient Romans used compost tea), to encourage more people to try using this organic fertilizing method. Compost Tea Making is not only a practical guide, but a personally and passionately written book, drawing connections between the way we garden and the well-being of our environment and society. That book seems as a great read for my entire family, as my grandmother and mom are going to be extremely happy with it! Keeping the closest connection possible with the Earth and tending for our own plants,flowers and food is the best thing one can do and I am going to definitely purchase it ASAP! Thanks so much for introducing me to it! It’s a pleasure to hear of your family’s enthusiasm for the topic, and I’m glad I could connect you with this resource. You’re welcome to come browse the arboretum library’s copy of the book, and if you’re a member, you can even borrow it. I wish you happy, healthy gardening. Compost tea is probably a useful thing. But the matter is that it takes a lot of time to be prepared and nobody knows what kind of bacteria and funguses he grows. Together with useful bacteria there can live harmful fungi and other plant diseases in your compost. Instead of it you can take already done and guaranteed microorganisms which will work in the soil and on plants as fungicides and insecticides. Any harm, any lost time, any equipment. The whole you need is the biological preparation and water. To be sure visit the page 3 duby dot altcompostea dot x90x dot net. Believe me you’ve never seen something better. Thank you for sharing information about your company. You raise some important points. For example, most compost producers recommend leaving diseased plant material out of the pile for the reasons you mentioned. Another trick to getting the “right” microorganisms in your compost is to inoculate it with a couple handfuls of topsoil from a wild or garden site that consistently thrives. I’d like to point out a distinction between the preparations you offer and the tea described in this book. The book is a guide to providing biological diversity to build a complete food web in the soil, including a wide range of microscopic predators. At the same time, I appreciate the benefits stated on your site about the particular bacterium and fungus strains in the preparations you offer and the greater level of convenience compared to brewing your own.